Happy Earth Day from the Griffin Gate Golf Club! ​As a proud member of the Audubon Cooperative Program for Golf, our Rees Jones designed course sustainably protects our environment and preserves the natural heritage of the game of the gold. Through this program, Audubon International has developed a set of standard environmental management practices that are applied daily to our operation. 1. Golf Courses are professionally managed landscapes where environmental stewardship is important - from using water and nutrients more efficiently to implementing improved methods of erosion control. 2. In general, the golf industry is striving to deliver firm playing surfaces that are better for everyone and improve the bottom line. More than 70 percent of golf courses report that they are keeping turfgrass drier than in the past..
​3. The golf industry is continually investing in research to identify drought-tolerant grasses and improve water conservation through best management practices..
4. Golf courses adopt water conservation practices, reduce irrigated acreage and use innovative technologies, such as targeted irrigation systems and ground moisture measurement tools, along with weather monitoring systems, providing the science to water only when and where it is needed..
5. Irrigated areas on golf courses have decreased by more than 14,430 acres between 2006 and 2013..
6. Use of recycled water has increased by 32.7 percent from 2006 to 2014. 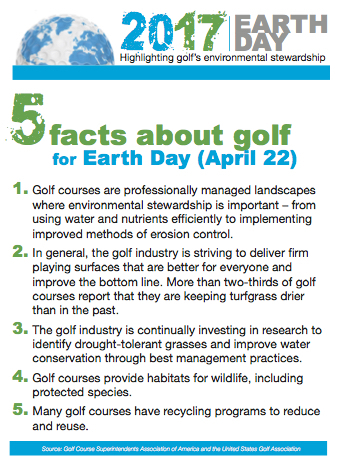 Recycled water accounts for 25 percent of all water used on golf courses. 7. Golf courses routinely have waste and water recycling programs to reduce and reuse. 8. More than 90 percent of a typical golf course is comprised of turfgrass, a water feature or other natural areas that prevent erosion, filter runoff, and provide for cooler temperatures when compared to urban settings. 9. More than 70 percent of acreage on an 18-hole golf course is considered green space that provides benefits to the ecosystem, reduces maintenance and supports wildlife habitat, including protected species. 10. Through governmental affairs involvement, professional education and public information, the golf industry promotes environmental responsibility as a widespread industry practic​e. ​Happy Earth Day from Griffin Gate!